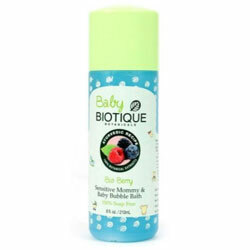 This gentle 100% soap-free bubbling wash is a natural blend of wild berries, sandalwood oil, honey and aloe vera to make baby's and mommy's bath time a delightful experience. Pour a generous amount directly under warm, running water, until baath is full. Rinse thoroughly.